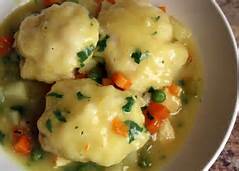 For those who love Chicken and Dumplin’s, why wait for a snow day? But it was one of the most popular answers to a recent Facebook and Twitter poll on favorite Snow Day meals. Now that the weather is back to 70 degrees, it seems strange that we were talking about Snow Day food last week! Wendy Rushing, Joan Schepperly and Deven Hitt all love to make chicken and dumplings when “the weather outside is frightful, but inside it is so delightful!” Kimberlee Nicholas loves her mom’s (Lynda Pepper’s) homemade chicken and dumplins. “Oh man, now I really want some,” Nicholas said. Boil hen in a large soup pot of water and two sticks of butter until tender. Once done, remove hen to cool for deboning. Do not throw away broth, but strain it for bones and other bits. Cut shortening into 4 cups of flour. Add milk or buttermilk until you have a large ball. Sprinkle with flour for easier handling. For strip-style dumplings, roll out dough to ½ inch on floured waxed paper and cut into strips. For ball-style dumplings use a spoon to scoop small wads of dough. Bring broth back to a rolling boil. Put half a cup of flour on a plate and lightly coat strips or wads of dough before dropping into the boiling water. Do not stir the dumplings until they have time to firm up in the boiling water for 5 or 10 minutes, but make sure they don’t stick. The extra coating of flour will thicken broth, but if you prefer thicker broth, dip out a half a cup of broth, add two or three tablespoons of flour and mix to a paste consistency and with as few lumps as possible. Gradually add the paste back in to the mixture. Remove dumplings from heat. Add chicken from hen and mix together. Add salt and pepper to taste. If you are too busy to make homemade dumplings. Ferguson said her mother would use regular canned biscuits, floured, and pinched into pieces. “I actually prefer these to homemade because to me they taste like my childhood,” Ferguson said. Use 4 large cans of biscuits (buttermilk-style not buttered) for this recipe. Can’t you just taste it now! Priss Ferguson said in preparation for the wintry weather conditions last week, she cooked a hambone and made cornmeal dumplings to go with black-eyed peas, slaw, baked sweet potatoes and banana pudding! “My Mama would be proud of me,” Ferguson said. She said there was no recipe for her hambone and cornmeal dumplings. Boil hambone in several cups of water and pull meat off the bone. Use self-rising cornmeal– about the same amount used for skillet of cornbread. Chop an onion and two boiled eggs into dry mix. Use HOT water to make stiff batter. Have ham broth boiling. Use a tablespoon to drop dumplings into broth. (Ferguson will form the dumplings with her hands.) Let the dumplings cook in the broth for about five to 10 minutes. Some dumplings will stay firm. Some will not. That makes almost like a thick mush. Add ham to dumplings or serve separately. “(They are) so good!” Ferguson said. Donna Stewart, Shirley Lane, Amanda McAlpin and Valerie Palmer all love vegetable soup with cornbread. On a recent freezing cold afternoon, Nancy Latham said she had a bowl of vegetable soup/beef stew and a pone of cornbread on cooking. Faye Sellers also said she was making a huge pot of beef stew in preparation for the weekend weather. Pam Karr and Gail Week both warm up with Corn Chowder and a buttery slice of cornbread on a cold winter’s day. A few other suggestions were: Red Beans and Rice from Christie Colvin. Mary Merner likes to make a bean soup. (I know Aunt Margie makes a Hambone and Bean Soup that Pepper and Mitch absolutely LOVE!) And Bonita Perego loves to make gumbo on a cold day. Shelia Murphy said she loves any homemade soup on a cold day, but she makes grilled pimento cheese and bacon sandwiches– that sounds amazing! But I think Cindy Alderman had one of the best answers. At least she knows what she likes! Someone said they loved snow ice cream, but that’s not exactly food that will warm you up! And at the end of a snow day, after hopefully making snowmen, fighting a snowball war and taking gorgeous snow photos, the Sissons love sitting by the fire having a cup of hot chocolate right before bed. Unfortunately, for most of us (including me and Pepper) there was only a little ice and a few flakes of snow this weekend. It barely stuck. There was nothing fun to do on a winter weather advisory weekend, but it was still too cold to be outside! Thank goodness for “duck boots” and heated seats in the car. Mississippi weather is nothing but unpredictable, but we can always hope for that nice snowy winter day that does not lead to ice storms and no electricity; fluffy snow for snowball fights that doesn’t lead to bruises or the emergency room; a day perfect for tomato soup and grilled cheese sandwiches, followed later by a cup of hot chocolate right before bed. Do you have a favorite food that you make on a snow day, or remember your mom making when you were little? Email me at gwenwoodssisson@yahoo.com. See this column in the January 19, 2017 edition of The Winona Times.